Received May 4, 2018; Accepted June 26, 2018. Rivaroxaban, a factor Xa inhibitor, is one of the newly developed direct oral anticoagulants (DOAC). In recent times, it has been increasingly used in the prevention of pulmonary embolism in patients undergoing orthopedic surgery. This report describes a case of epidural hematoma in an elderly patient who underwent combined spinal epidural anesthesia for total knee arthroplasty; the patient received rivaroxaban postoperatively for 7 days to prevent pulmonary embolism. Additionally, the epidural hematomas developed on the 5th postoperative day but the patient recovered well with conservative treatment. Although rivaroxaban has a low need for monitoring and is easily administered, the guidelines should be carefully checked for the postoperative administration schedule in patients undergoing regional anesthesia. In addition, rivaroxaban should be used with caution, especially in elderly patients. irect oral anticoagulants (DOACs), including anti-IIa (dabigatran, pradaxa) and anti-Xa (rivaroxaban, apixaban, edoxaban), are the most recently introduced anticoagulants. Compared to warfarin, DOAC has a faster onset, predictable therapeutic range, shorter half-life , and relatively lesser interaction with other medicines and foods. It can be easily administered in a fixed dose as an oral preparation without blood coagulation monitoring . Therefore, there has been a surge in its use in patients with non-valvular atrial fibrillation and in recurrent venous thromboembolism. Recently, rivaroxaban has proved effective in preventing symptomatic deep venous thrombosis (DVT) and pulmonary embolism (PE) after hip or knee arthroplasty and its use for this purpose has shown an increased trend . However, since postoperative bleeding may occur at the surgical site or at the site of regional anesthesia, careful use is necessary with respect to each individual patient and the usage guidelines. In this report, we present a case of a patient who developed a symptomatic epidural hematoma after postoperative administration of rivaroxaban and the need to consider extreme caution in its use for epidural anesthesia in hip or knee arthroplasty. A 70-year-old woman (height 151 cm, weight 56 kg), with left knee pain since 10 years, was scheduled for a left total knee arthroplasty under combined spinal epidural anesthesia. There was a past medical history of hypertension and myocardial infarction. A cardiac stent had been inserted 10 years ago, after which, aspirin had been prescribed. The patient had also been diagnosed with hyperthyroidism, and underwent a discectomy of the L4–5 intervertebral space, 4 years ago. The aspirin intake was stopped 6 days before surgery. On admission, the vital signs were stable and preoperative laboratory values, including coagulation test, were within normal range (prothrombin time international normalized ratio [PT INR] 0.97, prothrombin time [PT] 10.6 seconds, blood urea nitrogen [BUN] 18.1 mg/dl, creatinine 0.64 mg/dl and a platelet count 218,000 /µl). There was no back pain or any neurological symptoms. After arriving in the operating room without premedication, the electrocardiogram, non-invasive blood pressure, and pulse oximetry was monitored. Combined spinal epidural anesthesia was administered with an 18–gauge Tuohy needle in the lumbar 3rd–4th vertebral section, via median approach. Intrathecal injection of 0.5% hyperbaric bupivacaine (10 mg) and fentanyl (10 µg) was given and an epidural catheter was placed 4 cm in the epidural space. In the following 5 minutes, the extent of the sensory block was up to thoracic 8th vertebra. To check the epidural catheter, 2% lidocaine 2 ml with 1:200,000 epinephrine was administered as a test dose through the epidural catheter. There were no cardiac or neurological side effects. Sedation was performed with 100 µg/ml dexmedetomidine (Precedex®, Pfizer Pharmaceuticals, USA). The initial loading dose was 0.7 µg/kg/ml for 10 minutes and the maintenance dose was 0.3 µg/kg/ml. During the surgery, the degree of anesthesia was measured by bispectral index (BIS), maintained at 70–80, and the vital signs including oxygen saturation were stable. The total anesthesia time was 115 minutes, total operation time was 55 minutes, total fluid intake was 850 ml as crystalloid solution, and estimated blood loss was 200 ml. Postoperative appropriate pain control was achieved by patient controlled epidural analgesia (PCEA) and the sensory and motor nerves of both lower limbs returned to normal 4 hours after the operation. Twelve hours after the epidural catheter was inserted, 10 mg rivaroxaban (Xarelto®, Bayer HealthCare AG, Germany) was given orally, once a day. On the 2nd postoperative day, a surgeon removed the epidural catheter, 18 hours after taking rivaroxaban. At the time of removal, there was no problem in the sensory and motor nerves in both the lower limbs of the patient. No hematoma or bleeding was observed at the site where the catheter was removed. On the 5th postoperative day, the daily dose of rivaroxaban was given at 6 am; 8 hours later, a radiating pain and numbness in both the lower extremities was observed, especially in the thighs. Therefore, orthopedic surgeons decided to conduct a magnetic resonance imaging (MRI) and the findings showed an epidural mass of suspected hematoma at the L3–5 vertebral level (Fig. 1) and hence, consulted a spine specialist neurosurgeon. The specialist’s observation was that the symptoms disappeared after 5 hours and no neurological deficits were observed. Furthermore, he recommended a follow-up MRI 2–3 months later. The patient’s symptoms recovered gradually and on the 9th postoperative day, she was discharged without any sensory and motor nerve damage. 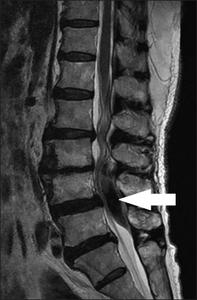 Sagittal lumbar magnetic resonance imaging revealing a dorsal epidural hematoma at the L3–5 vertebral level (arrow). DOACs were introduced around 2010. The reason for this nomenclature was that they have an anticoagulant effect by directly bonding with the coagulation factor. On the other hand, heparin represents an anticoagulant effect by combining with antithrombin-III and warfarin shows anticoagulant effect depending on vitamin K . The benefits of DOAC are oral administration, short onset and duration, lesser need of monitoring and fewer interactions with concomitant medications and foods. This agent can be divided into 2 categories, direct thrombin inhibitor including dabigatran and factor Xa inhibitor. The rivaroxaban used in this case belongs to the factor Xa inhibitor category . The most common indications of DOAC are acute treatment and secondary prevention of DVT and PE, and stroke prevention in patients with atrial fibrillation. Recently, the use of DOAC has increased in the prevention of DVT and PE in knee or hip replacement surgery . DOAC is a recently introduced drug and its accumulated experience and side effects have not been reported extensively. Its guidelines have been only recently established and those for different cases have not yet been accumulated. Therefore, if an anesthesiologist encounters a patient taking DOAC, the anesthesiologist will be worried about when to interrupt the DOAC before the surgery. The company (Janssen Pharmaceuticals, USA) recommendation is “An epidural catheter should not be removed within 18 hours after the last administration of rivaroxaban. The next rivaroxaban dose is not to be administered earlier than 6 hours after removal of the catheter.” According to the pharmaceutical company guidelines, it is safe to remove the epidural catheter 18 hours after taking rivaroxaban. However, American society of regional anesthesia and pain medicine (ASRA) guidelines recommend that neuraxial anesthesia should be considered a high risk procedure . Therefore, dabigatran should be stopped 4–5 days and other factor Xa inhibitors should be stopped 3–5 days, before the procedure. Moreover, re-initiation of DOAC therapy should be postponed up to 24 hours post-procedure or after catheter removal. In our case, according to the pharmaceutical company guidelines, rivaroxaban was administered to the patient 12 hours after the epidural catheter was inserted, and the epidural catheter was removed by the surgeon 18 hours after taking rivaroxaban. Symptoms induced by epidural hematoma appeared on the 5th day. Even though we followed the pharmaceutical company guidelines, the possible reason that epidural hematoma appeared was that the pharmaceutical company guidelines were based on pharmacologic half-lives rather than individual patient’s condition or consideration of the severity of the procedure. In this case, the patient was a 70-year-old elderly patient. In elderly patients, the half-life of the drug may be widely prolonged and the half-life of DOAC is effectively longer . In addition, DOACs are eliminated from the liver and kidneys. The direct thrombin inhibitor dabigatran is cleared by the kidneys (85%). The factor Xa inhibitors, rivaroxaban, apixaban and edoxaban, not removed by the liver, are excreted by the kidneys (33%, 27% and 35%, respectively) . Due to the high reliance on renal excretion as described above, the half-life of the drug is prolonged in patients with decreased renal function. Especially in elderly patients, even with normal preoperative renal function, postoperative acute renal failure is common. Thus, the drug in this patient was considered to have an increased half-life than the pharmacological half-lives and this was the possible reason for hematoma formation. Fortunately, because of the relatively large inter-laminar space due to previous spinal surgery, the patient’s symptoms were not as severe as compared to the size of the epidural hematoma. The management of bleeding complications post DOAC use can be divided according to the degree of bleeding. In the case of minor bleeding as seen in this case, local hemostatic measures and anticoagulant withdrawal can be considered. In the case of moderate bleeding, anticoagulant withdrawal, compression, monitoring hemodynamic status, volume replacement and intervention can be performed, and RBC transfusion may be considered when anemia occurs. For monitoring of factor Xa inhibitors, PT and chromogenic anti-Xa assay can be used and diluted thrombin times (dTTs), the ecarin clotting time (ECT) assay are effective tests to monitor thrombin inhibitors . Currently, majority of hospitals do not have coagulation monitoring of DOAC. In severe bleeding, active intensive care and transfusion should be performed along with oral charcoal for dabigatran ingestion within 2 hours and hemodialysis for dabigatran removal . It can also be treated with idarucizumab when using darbigatran. Another treatment for severe bleeding is the prothrombin complex concentrate (PCC). It contains factors II, IX, and X with variable amounts of factor VII, protein C, and protein S and is fast and effective in correction of the INR [10,11]. DOAC is an advanced anticoagulant that goes beyond the disadvantages of conventional anticoagulants and gives convenience and satisfaction to patients and clinical physicians. An important advantage of DOAC compared to conventional anticoagulants is that it does not require routine anticoagulant monitoring because of the pharmacokinetics and pharmacokinetic predictability of DOAC . However, patient risk may be increase synergically as the cumulative effect of multiple small risk factors. Therefore, it is necessary to accumulate actual clinical experiences about the timing and method of appropriately ceasing the DOAC prior to neuraxial techniques; also, to establish guidelines and accomplish appropriate uses, the patient’s situation in the peri-operative periods must be carefully considered . In addition, it is important to consider the drug usage through a variety of documents in multiple ways. This should be considered carefully because the proper tests are not smooth yet. Therefore, presently, it is necessary to evaluate the patients on the basis of various guidelines and carefully use drugs according to each individual patient. In patients with multiple risk factors, early diagnosis and treatment of complications should be made possible. Mekaj YH, Mekaj AY, Duci SB, and Miftari EI. New oral anticoagulants: their advantages and disadvantages compared with vitamin K antagonists in the prevention and treatment of patients with thromboembolic events. Ther Clin Risk Manag 2015;11:967-77. Douxfils J, Ageno W, Samama CM, Lessire S, Ten Cate H, and Verhamme P et al. Laboratory testing in patients treated with direct oral anticoagulants: a practical guide for clinicians. J Thromb Haemost 2018;16:209-19. Mao YC, Chen ST, Chen CH, Hsieh KP, and Gan KH. Rivaroxaban in preventing venous thromboembolism after arthroplastic surgery in Taiwan. Kaohsiung J Med Sci 2015;31:534-9. Ruff CT, Giugliano RP, Braunwald E, Hoffman EB, Deenadayalu N, and Ezekowitz MD et al. Comparison of the efficacy and safety of new oral anticoagulants with warfarin in patients with atrial fibrillation: a meta-analysis of randomised trials. Lancet 2014;383:955-62. Uchiyama S, Ibayashi S, Matsumoto M, Nagao T, Nagata K, and Nakagawara J et al. Dabigatran and factor Xa inhibitors for stroke prevention in patients with nonvalvular atrial fibrillation. J Stroke Cerebrovasc Dis 2012;21:165-73. Spyropoulos AC, and Douketis JD. How I treat anticoagulated patients undergoing an elective procedure or surgery. Blood 2012;120:2954-62. Robert-Ebadi H, Le Gal G, and Righini M. Use of anticoagulants in elderly patients: practical recommendations. Clin Interv Aging 2009;4:165-77. Conway SE, Hwang AY, Ponte CD, and Gums JG. Laboratory and clinical monitoring of direct acting oral anticoagulants: what clinicians need to know. Pharmacotherapy 2017;37:236-48. Albaladejo P, Samama CM, Sié P, Kauffmann S, Mémier V, and Suchon P et al. Management of severe bleeding in patients treated with direct oral anticoagulants: an observational registry analysis. Anesthesiology 2017;127:111-20. Cuker A, Siegal DM, Crowther MA, and Garcia DA. Laboratory measurement of the anticoagulant activity of the non-vitamin K oral anticoagulants. J Am Coll Cardiol 2014;64:1128-39. Siegal DM, Garcia DA, and Crowther MA. How I treat target-specific oral anticoagulant-associated bleeding. Blood 2014;123:1152-8. Burjorjee JE, Rooney R, and Jaeger M. Epidural hematoma following cessation of a direct oral anticoagulant: a case report. Reg Anesth Pain Med 2018;43:313-6.